Today is November 12. This date used to be totally insignificant to me, but two years ago, it had a life changing impact on me. I've already told the story a few times, so feel free to skip this post. If you want to read the whole story with details, you can find it here. It was two years ago that I fainted and broke my jaw. I know that people break bones all the time, and it's really not that big of a deal, but I had never had a broken bone in my life until that day. And on that evening, I fainted, fell flat on my face, and broke my jaw severely through in five places. I still remember all the details so well. I remember what I was thinking, what I was feeling, what it felt like to try and clench my teeth together only to feel my lower jaw flopping in a way that it shouldn't. I remember thinking that I would go to the emergency room, have surgery to fix it, and then I'd be home by morning. I had no idea just how bad off I was until the doctor showed me the x-rays. My lower jaw was in six separate pieces, and my teeth (which I spent five years in braces to straighten!) were horribly misaligned. I had a hole through the front of my lower lip where the bone had punctured through. I had another hole on the underside of my chin. I couldn't talk well to explain what had happened, and people at the hospital kept asking if my husband did this to me. And the pain. Oh, the pain. I had no idea why I had fainted. I spent the next six days in the hospital having every test imaginable to determine the cause. 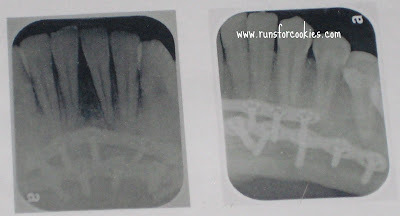 I also had two surgeries (four hours and three hours), where they put my jaw back together with titanium plates and screws, and ending with wiring my jaw shut. The cause of my fainting was never determined, and the doctors thought it was possible that I'd actually had a seizure, because of how hard I had to have hit the floor in order to cause a break that severe. I suspect it was one of two things: 1) I was taking medication for a cold--Mucinex and Sudafed. I've since taken Sudafed, and had no problems; I've taken Mucinex once since then, and it made me feel dizzy, so I would guess the Mucinex may have caused the problem; 2) I had binged on ice cream after not binge eating for a year. The doctors said the most likely cause was that I have low blood pressure. But we'll never know for sure what caused it. And thankfully, it hasn't happened again since! I'm terrified to eat too much sugar in one sitting now--and I won't eat the Turkey Hill Chocolate Peanut Butter ice cream at all (that's what I ate that night). My lower lip is still numb from my lip to the bottom of my chin. I can't make 'p' or 'b' sounds when I'm smiling--my lips won't close to make the sound. My jaw is now noticeably larger on one side than it is on the other. I realized just how important health insurance is. Those six days in the hospital would have cost us over $57,000 if we didn't have insurance. I am so grateful that we do. I had the most amazing, caring surgeon. It was he who helped me get over my fear of surgery, which led to my getting a lower body lift (he was also the one who recommended my plastic surgeon). My family and friends are simply amazing. I can't even stress that enough. I needed help in so many ways, and they helped without my having to ask. This day two years ago became one of those defining moments--"before I broke my jaw" and "after I broke my jaw". So many things had changed from that one moment. Anyway, I'm not even sure what the point of writing this post was. There isn't a day that goes by that I don't give a thought to when I broke my jaw--when I brush my teeth, put on make-up, eat, talk, smile, sleep, whistle (I actually can't whistle anymore)--all of it reminds me. I actually don't even think of it in a negatively; it was a learning experience in so many ways! You've come a long way, Katie. You're a strong, strong lady. That really just jerks at my heart. That's so scary, and I am so happy that you are okay. I'm glad you shared this again. It's a reminder to everyone that they need to appreciate what they have, especially health-related. It was such a SHOCK to my family and friends--and I definitely don't take health for granted anymore! I know how you feel! When you go through something life changing like that, it's hard not to think about it often, if not every day! I loved your interview on the podcast too by the way! I also had a life changing surgery and incident almost 3 years ago. Now when ever I describe things in my life it's pre-surgery me or post-surgery me, lol. Also I didn't hear you say "UM" once. It wasn't noticeable at all, and you did great!! You should start a podcast!! It's amazing how much of an impact one little incident can have, isn't it? I'm glad you enjoyed the podcast--that was a first for me, and I was nervous! I will listen to the interview as soon as I get home. Iam glad that you are okay...it just shocks me how you fell and broke your jaw. Exactly two days back when I was in the. shower I almost "fainted". I blacked out for almost 1/2 a second held on to the wall. Katie I love your blog & they are a part of my everyday life. Thanks for blogging. That's crazy! It's amazing how things can change in a blink of an eye! Glad to hear that you're all healed up and you've hadn't had another fainting spell again. I never used to think anything of feeling a little dizzy, but now every time I do, I worry that I'm going to faint again! I hope that I stop worrying about it someday. It sounds like it was a combination of all those things, Katie. I know I associate bad moments with certain things and you have every right to be a bit anxious about cold medicine as well as that ice cream! It very well could have been a bad combination of stuff that night--my low blood pressure, the binge, and the cold medicine, and my body was just kind of freaking out. Who knows?! I look forward to listening to your podcast. I started with the first podcast and am working my way to the new ones. I'm zooming through them, so I should be there soon! I hope you enjoy! I like listening to Heather--she's got some great tips! When a traumatic accident happens, you never forget the date, what you were doing, why you were doing it, and how to make sure it will never happen again. You are not alone. I think "noticeably larger" is relative. I've viewed lots of pictures of you and never thought anything about your jaw. After this post, I went back to look at your pictures and still don't see anything "noticeably larger." I *think* I can see what you are talking about my closely checking out the photos and looking at comparisons (but I am assuming some photos were before breaking your jaw), and I see something maybe but only looking closely and comparing. Without comparisons, I don't see anything noticeable at all other than your great smile. I can sort of relate to this, except my experience wasn't half as bad as yours. I remember when this happened to you. I read all your blogs about it on spark. It blew my mind. I know you had some down days, but for the most part I remember you handling this so well. You were as positive as you could be through this accident. It is/was inspiring. I broke my leg December 30, 2010, after losing 80 lbs, running several 5k's, and running a half marathon. I was pretty devastated b/c i couldn't workout or run for what seemed like a very long time. I was on crutches, in a cast, and in a boot for the first part of 2011. Even when my leg was healed, I just wasn't the same mentally. It broke my spirit. I have since gained almost all my weight back. But I have started walking and doing Weight Watchers and am on a much better path these days. I just really understand how everything you say is "before i broke my jaw" "after I broke my jaw." Because for me it's "before i broke my leg" and "after i broke my leg." I really look up to you and wish I had handled my accident as well as you did and have. Wow, Brook, that's awful! I can definitely relate to feeling like your spirit is broken. I went through that a little while I was recovering, but if I hadn't been able to run, I don't know how I would have felt. That must have been awful for you. I'm sure you can lose the weight again! My doctors all said that it's actually not that uncommon for people to pass out for no reason at all once in their lifetimes. The reason they were so concerned for me was because of my broken jaw--they thought maybe it was a seizure, and wanted to get answers for that reason. That must have been so scary when your brother fainted! I am so thankful that my kids were sleeping when it happened to me, because that would be awful for them to see. Hi Katie! I remember your accident clearly, although I don't think you were a able to blog about it for a few days (weeks)? Must have been awful, but it certainly has redefined you hasn't it? There are events in our life like that. I haven't had a serious medical incident like that myself, but I do remember vividly the day about 6 years ago when the hospital called to tell us that hubby's lymph node scan was clear, no evidence of cancer spread. What a relief! I also remember the days both my parents died (17 years apart), those days all become defining moments in your life. They hurt, they change you, and they all go into making you what you are today. You proved how strong you are Katie! I listened to the podcast at work yesterday. It was wonderful. She gave you lots and lots of time to talk about everything that was important to your weight loss and maintenance and I loved that. I will have about 30 seconds to talk about myself on the Today Show. Not nearly long enough to share all the stuff we have both been through, but I'm beyond excited about this opportunity. I'm glad you liked the podcast! I was super nervous at first, but Heather is very easy to chat with. I can't wait to see you on the Today Show!! I had jaw surgery (though it was planned--to correct my strong jaw) and I totally lost feeling from my lower lip to my chin, too! The doctor said that the feeling would come back in 6 months, but it's been 10 years and still nothing. I almost always dribble down my chin when I eat soup because I can't feel it--and then I look like a total slob. Do you get phantom tickles on your lip/chin? They're the WORST, aren't they? Mine happen much less often now, thank goodness. Well at least it's not just me, then! ;) I know what you mean about the dribbling--I do that too. I also get the phantom tickles, and it's so annoying. I have the same phantom tickles around my body lift scar, and that drives me crazy. I can't scratch it (because it's numb) but it itches. I'm so glad you are looking back and learning from the experience. How awful that it happened but you have learned a lot from it and that is what life is all about. I heard your story on Half Size Me (found her podcasts thanks to you actually). You were really great!! You are being so hard on yourself with the umms. I didn't even notice it. You rocked it girl. Good job! Thanks! I think once I heard the first one or two, I just kept cringing every time I heard another ;) But I'm glad it wasn't too distracting! I ran while listening to your podcast today and loved it!! My run went by so quickly.